"Easy to Read" Sports Blog from a very opinionated sports freak...who just so happens to have a journalism degree and a background in sports. Because the world needs ONE more medium to discuss life's greatest joy...(no not kids). Twas the night before the Stanley Cup Finals and all through the land…all were determining of whom they would be a fan. I have been pressured yearly by my Canadian and Northern U.S. buddies to take an interest in hockey. This year I took the bait somewhat, spurred on by the Olympics in British Columbia. Actually, it started with the Juniors Gold Medal game between USA and Canada. Juniors is a “prep league” for professional hockey and this game was bigger than our Super Bowl in Canada. Seriously, it was crazy…and don’t expect to have an easy time finding an outlet to view Juniors hockey in America…though it was on EVERY TV in Canada. USA took the gold…lighting the fire for the USA vs. Canada Olympic match-ups. Throughout the season, I have followed 5 teams loosely. The Chicago Blackhawks being one of them. (Habs, Leafs, Bruins, Avalanche) Consistently at the top of NHL Power Rankings…the Blackhawks were a favorite for the Stanley Cup all season. I was able to see them at my first ever live hockey game this season vs. the Dallas Stars. So, that is my pick for the finals. However, before we begin the best of seven games to hand out the coveted goblet, I would like to draw your attention to a team who gets my “valiant effort” award of the season…though we already can see I am no expert. Raise your glass to le Club de Hockey Canadien…or the Montreal Canadiens! What a surprise they came to be! The Canadiens or the Habs as they are called…a shortened form of les Habitants…as natives to Quebec are referred to. Confused yet? Yeah…that is French Canada for ya. Montreal is one of the Original Six that formed the NHL in 1942 and have won 24 Stanley Cups…more than any other organization. But this season, the Habs were ranked in the bottom of the Power Rankings from week 1. Their last ranking was 18th out of 30. Making the playoffs, they were set to take on the Washington Capitals in the NE Division series…the Capitals ended the season first in the rankings. With the spirit of a team rich in hockey greatness, the Habs defeated the number one ranked club in seven games and moved to once again surprise. The Pittsburg Penguins, equipped with famed Sidney Crosby the hockey superstar from Ontario, fell prey to the Habs in 7 games as well. Fans mobbed the streets of Montreal and the Bell Centre prepared to host the Philladelphia Flyers in the Eastern Conference Finals. A series with the Flyers seemed to be ideal. The Flyers ended with a 14 slot in the Power Rankings and were no match in talent to the foes Montreal had already passed by. However, the Flyers ended the Habs finals hopes in five games. A solid season by Cammalleri, Gomez, and Plekanec…who top the stats chart for the Canadiens. A tremendous effort by a fun team to watch…even for a bunch of Canadiens! 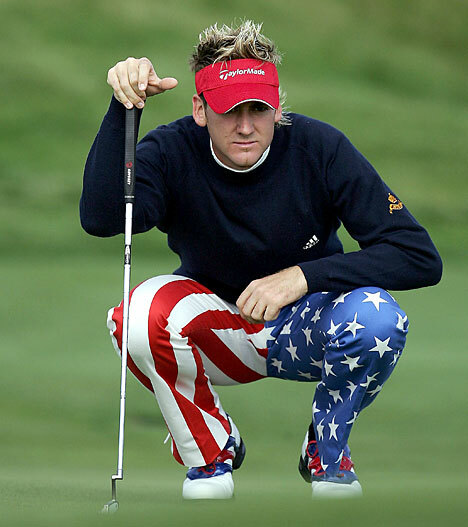 What beats Ian James Poulter's pretty pants on the golf course? His passion on and off the course! Ian Poulter is one of golfs' most colorful and exciting figures to follow. Yes his tartans, (pants as they are called in England) designed by his own label IJP Design, are stylish to say the least, but Pouler offers a unique style of professional golf that is refreshing. Sure sure...the usual suspects are great to watch on a Sunday afternoon: Tiger, Phil, Y.E. Yang...I mean Anthony Kim. But are they entertaining you day to day with their fun-loving personalities and zeal for life? Poults as he is affectionately called by friends and fans, lives to entertain. The Orlando AND London resident is one of Twitter's most active PGA professionals...and on Arsenal Game days...Poulter's beloved football club in London...He is VERY active! Poults lets fans into his life so extensively via Twitter and IJP.com one feels like they know him so much more than most other PGA Professionals. Isn't it more fun to feel you have a sense of who your favorite sports figures are? A devoted father and husband, loyal Arsenal fan, Orlando Magic season ticket holder, designer of his own golf apparel line, silly golfer from Across the Pond! A false look into his life?...genius PR? Who knows...if he is marketing it...I'm buying. My nephews have always called me KooKoo...but I am now known in numerous circles as KooKoo. I am a PROUD University of Oklahoma Alum, PGA Tour fanatic and fantasy golf champion (oh yeah! ), Chicago Blackhawks and Minnesota Twins faithful. Follow me on Twitter at @karakoo. I am also Director of Activities (Texas) for Support the Kid for Cancer, Inc. Please check out our website at www.supportthekid.org find us on facebook and follow us on Twitter.